So when we were first laying out the shower, we had all this space to the left of the shower head/handle to work with for cutouts (who doesn't love a cutout so you don't have to bend over to grab your shampoo?). But then the plumber had to use that space for the new pipes and so we were left with very small space on the right to work with. As such, my father suggested we make three vertical cutouts. 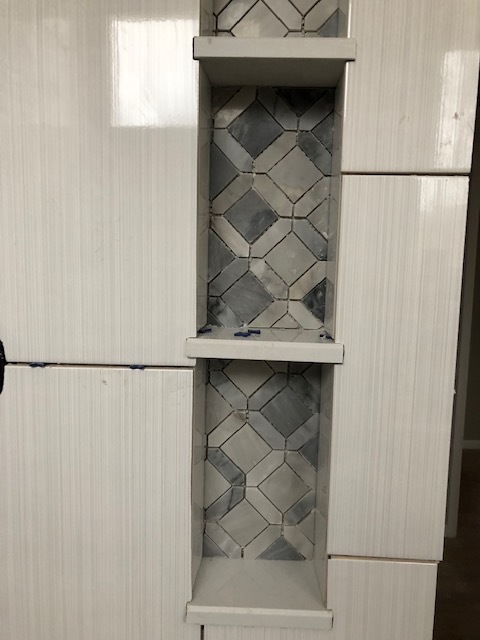 The shelves themselves are a white marble and then the sides are the shower tile. But the back of the cutout is the tile we'll be using on the floor. Fancy little tie-in, right? It was my father's idea. 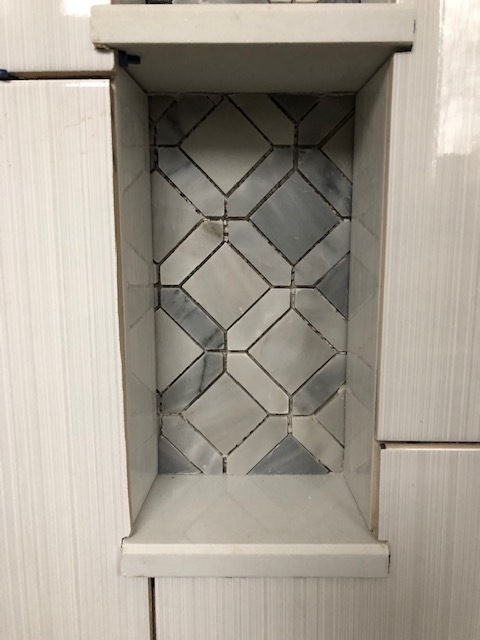 With all the little cuts and grooves that had to be made to make these cutouts fit seamlessly together, it ended up taking us a couple hours to complete. Sure, we could have made it easier for ourselves by not using the floor tile, but looks how good it looks! So yes, it was time intensive, but I think for the final product it was worth it. And once again, we're creating a house that's a thousand times better than my apartment. Womp, womp. When the plumber installs the rain shower head, I may just cry with envy.